I am the mother to five children, four of whom I parent every day. My fifth child, Hadley Jane, died in my arms on her third day of life. She was one of triplets, just as perfect as her siblings and just as loved. I miss her every single day. When someone says her name or lets me know that something about her short life touched their own my grieving heart smiles a bit. I’m not alone. So many parents out there have lost a child, whether by miscarriage, or still birth, or from complications shortly after birth. 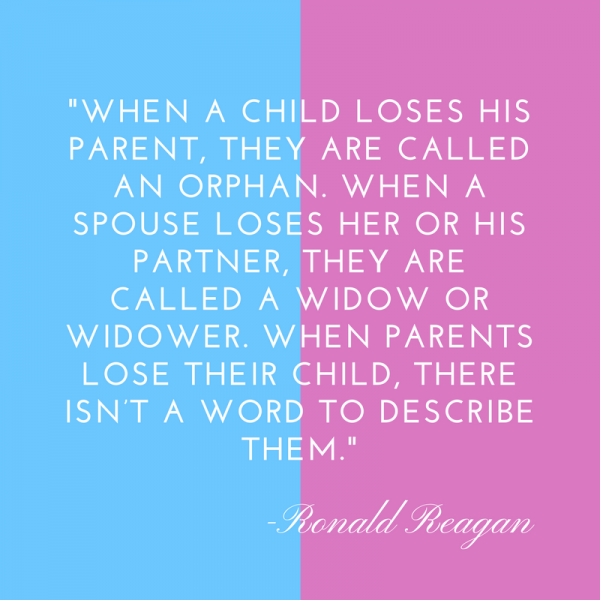 In fact, President Ronald Reagan designated October as Pregnancy and Infant Loss Awareness Month back in 1988, to break the silence suffered by families who have lost a child in one of these ways. Nearly 30 years later, people still squirm when I tell the story of my daughter’s short life. I don’t blame them for wanting to hear stories of healthy babies and beaming parents, to hold tight to their belief that something so tragic would never happen to them — but it’s important to remember stories like mine. It’s important to let grieving mothers know that the babies they carry in their hearts are just as cherished as the ones they carry in their arms. We have awareness days and months for every cause under the sun, with corresponding ribbons that are worn like blinking banners of support. But, I’m pretty sure if I headed out in the world with a pink and blue ribbon on the fall sweater I’ve been waiting to wear since July no one would know I’m wearing it for the daughter we lost. Many people don’t even know about Pregnancy and Infant Loss Awareness Month because society has decided that it’s taboo to discuss miscarriage and neonatal loss. However, there are simple things we can all do to help break the stigma. 1. Reach out. If you know someone who has suffered a miscarriage or lost an infant, reach out to them this month. I often see women share graphics or articles about miscarriage or infant loss on social media and those posts rarely have any comments. Silence speaks volumes, so write something. Tell them you are sorry for their loss. Message them privately if you’ve been there, too. If you aren’t sure what to say just put a heart in the comments; even an emoji is better than nothing. Acknowledging their loss is so important. Let them know you haven’t forgotten. I guarantee they haven’t either and will be grateful for your kind words. 2. Show your support. Social media has made it so easy to show our support for different causes. This month you can share the staggering statistic that one in four women will experience a miscarriage or post your own awareness message. Jessi Snapp, the artist and bereaved mother behind Luminous Light Studios, created profile and banner art specifically for this month and has generously made it available for public use on Facebook. 3. Do something. There are events all over the world this month, from candlelight vigils to lantern releases. International Wave of Light takes place on October 15; at 7 p.m., you can light a candle in remembrance of your lost pregnancy or baby, in an act of solidarity with other parents who have been through the same thing. Find out what is happening in your area and go. Or, offer to go with a friend who may be alone in her grieving. No matter what you do during Pregnancy and Infant Loss Awareness Month, don’t pretend it doesn’t exist. Break out of your comfort zone a bit and share your own story or listen to one that is begging to be told. I’ve shared my story. Now, it’s your turn. Leave your story in the comments. I promise to read them all. Together we will break the silence and maybe in another 30 years we will all be heard, loud and clear.